Jo Berry with some students at Langdon Park School which is one of the schools we will be working in. 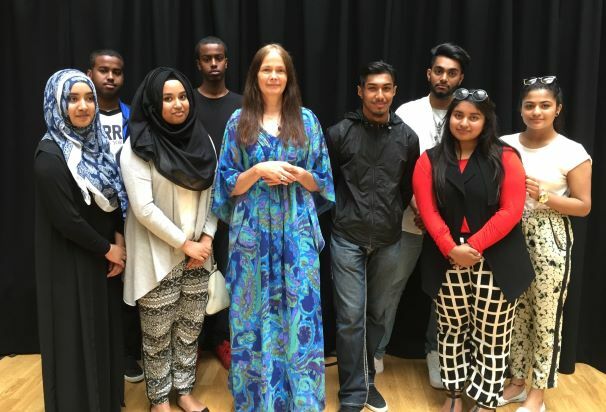 Building Bridges is thrilled to have received funding to work in school in Tower Hamlets. The project will be carried out in schools, ‘Schools partnership for empathy based mutual respect’. As well as being deliver the work we love to do we are now part of a network of others countering extremism. We are providing a positive alternative to extremist views and have the outcome of fewer people holding attitudes, beliefs and feelings that oppose shared values. We will be publishing the results of the evaluation survey which is being carried out by an independent body of our project later in the year.